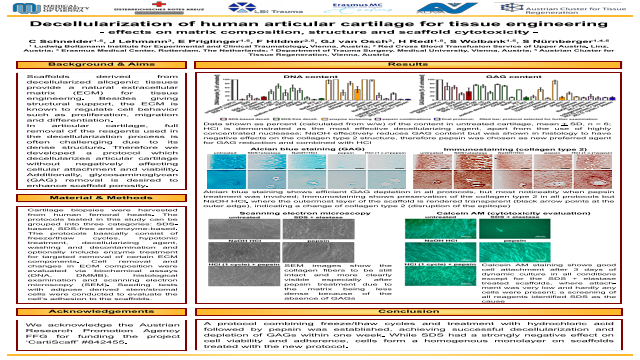 Abstract: Scaffolds derived from decellularized allogenic tissues provide a natural extracellular matrix (ECM) for tissue engineering strategies. Besides giving structural support, ECM is known to regulate cell behavior such as proliferation, migration and differentiation. Cartilage biopsies were harvested from human femoral heads. The protocols tested in this study can be grouped into three categories: SDS-based, SDS-free and enzyme-based. The protocols basically consist of freeze/thaw cycles, hypotonic treatment, decellularizing agent, washing and decontamination and optionally include enzyme treatment for targeted removal of certain ECM components. Ionic and non-ionic detergents, oxidizing agents as well as acids and bases were tested as decellularizing agents. The enzyme screening involved hyaluronidase, collagenase, pronase, pepsin, elastase and combinations thereof. Cell removal and changes in ECM components were evaluated via biochemical assays (DNA, DMMB), histological examination and SEM imaging. Furthermore, seeding tests with adipose derived stem/stromal cells were conducted to evaluate the cell’s affinity to attach to the scaffolds. By using SDS-based protocols satisfactory reduction of DNA content could be achieved, however scaffolds treated with SDS showed low cell attachment and cell viability. Among the other chemical agents, sodium hydroxide was established as most effective for glycosaminoglycan (GAG) reduction and hydrochloric acid proved to efficiently decellularize the scaffold, reducing the DNA content by 97%. In a screening of various enzymes, pepsin emerged as best option for GAG depletion and was thus chosen to replace sodium hydroxide in the final protocol. Histological stainings indicated a strong reduction in GAGs while the collagen II staining was unchanged. SEM images revealed the ECM to be less dense than in native tissue, possibly facilitating cell ingrowth. Seeding tests showed good adhesion of cells on top of the scaffold.